We are pleased to announce the nineteenth release of Orion, “Your IDE in the Cloud”. You can run it now at OrionHub, from NPM or download the server to run your own instance locally. Once again, thank you to all committers and contributors for your hard work this release. There were 11 bugs and enhancements fixed, across 36 commits from 5 authors. We are pleased to announce the seventeenth release of Orion, “Your IDE in the Cloud”. You can run it now at OrionHub, from NPM or download the server to run your own instance locally. Once again, thank you to all committers and contributors for your hard work this release. There were 86 bugs and enhancements fixed, across 248 commits from 13 authors! This release was focussed entirely on making compatibility, stability and overall quality improvements to the Node.js server. We are pleased to announce the sixteenth release of Orion, “Your IDE in the Cloud”. You can run it now at OrionHub, from NPM or download the server to run your own instance locally. Once again, thank you to all committers and contributors for your hard work this release. There were 169 bugs and enhancements fixed, across 236 commits from 16 authors! This release was focussed on making compatibility, stability and overall quality improvements to the Node.js server. We also dark launched debugging support directly in Orion – although not completely polished, it is available for the community to try. After three more months of hard work from committers and our amazing community, we have another great release! 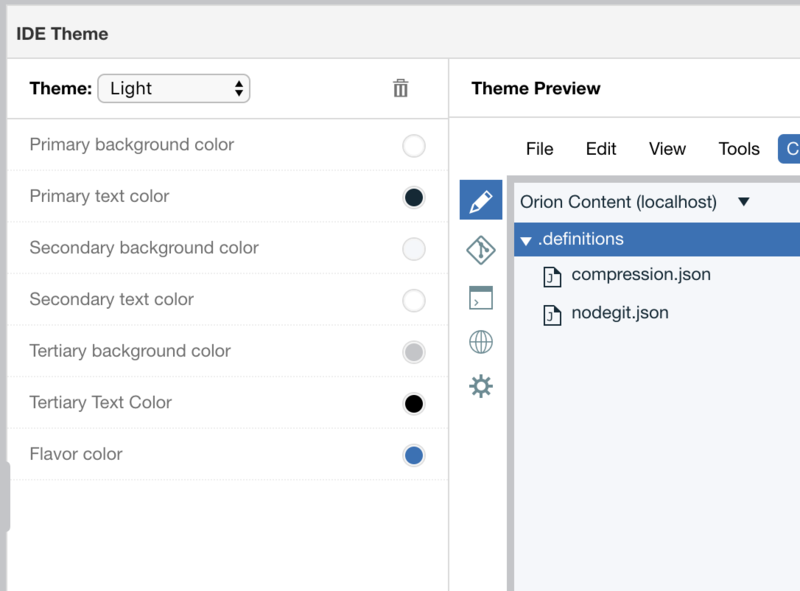 This release continued our mission to make Orion as accessible as possible for all developers, included many UX improvements and has a lot of new language tooling features. We’re continually improving Orion to be the best possible experience for all developers. In Orion 15, we have improved keyboard access, menu navigation and better handling of “splitters”. 2. Extend the F2 capability for the editor to show an annotation hover to also show (and put the focus on) any available tooltip for the element with the focus, regardless of the page you’re on (i.e. works on the Git and Settings pages as well now. ESC will return focus to the original element. 3. Make sure that all modal dialogs will ‘trap’ the tab key usage and correctly cycle through the dialogs’ elements. On the Edit page if the focus is on the main menu you can now use the arrow keys to navigate to any item in the whole menu structure. There is a new command Command + Shift + ‘.’ available that will cycle through each splitter on the page, granting it focus. Once focussed you can use the arrow keys to move the splitter, Enter to toggle the splitter’s ‘thumb’ (if any). ESC will return the focus to the original element. Consumers of the widget now have complete control over the keybindings in use – with improved support to completely override the default bindings the come with Orion. More details can be found on the in-depth how-to wiki page for the widget. When working within docker files, Orion 15 now has support for content assist to make things easier. Assist uses the standard Ctrl+space keybinding. There have been many improvements in the content assist for other languages as well. For example, assist within CSS files got a substantial overhaul and now provides more complete and correct assist for rules and attributes. While working in your .tern-project file, you can now hover over entries in the file to get additional information and help. While working in your package.json file, you can now hover over entries in the file to get additional information and help. While working in your eslint configuration file(s), you can now hover over entries in the file to get additional information and help. The hover support for ESLint configuration entries is also available within your package.json file in the eslintConfig section. The hover support is not available yet in the *.yml and *.yaml variants of the ESLint configuration files. Rather than having to type out all of the names of resources you want to be filtered from the explorer views, we have updated the preference to support wildcards like ? and *. Finally. 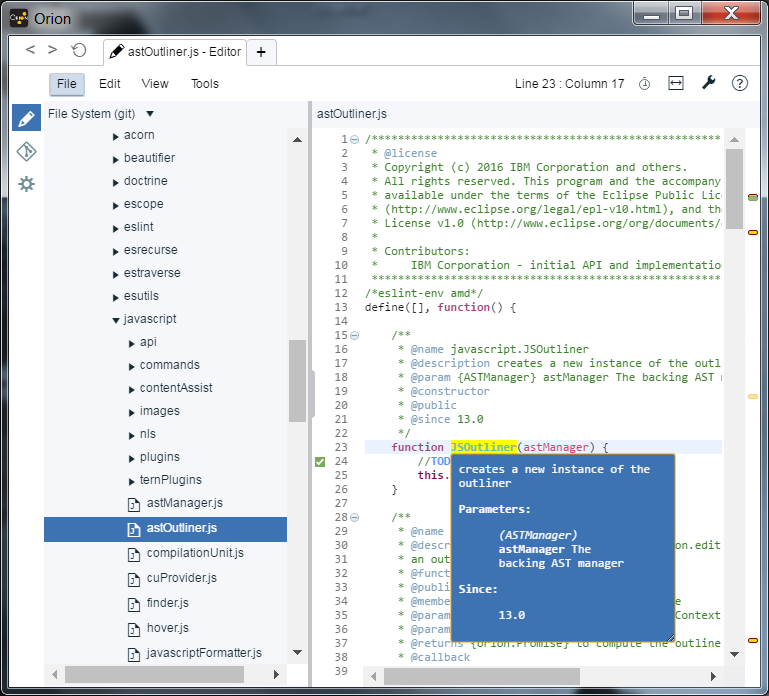 After all this time, we have support in Orion for multiple editor tabs! By default Orion still works in the “one editor per browser tab” mode, but you can start using editor tabs by simply turning on the preference in the General prefs section. Once enabled, you can open multiple files within a single editor, rather than have multiple browser tabs open. Tabs can be closed, dragged, reordered, and switched to using convenient keybindings. Plugins can now contribute their own themes to style Orion. All of the information related to the new orion.core.container.themes.provider service can be found on the API documentation wiki page. The Orion platform now has support for multiple workspaces! 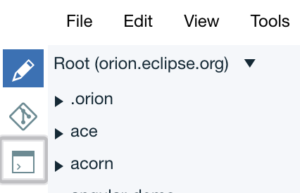 This allows consumers of Orion to better organize their files by having multiple source repositories spread across multiple workspaces instead of one gigantic workspace filled with many unrelated repositories. By default Orion does not have end-user support to create and manage multiple workspaces, so third party support is required. A lot of work went into making the Node.js server more stable and making sure it was feature-complete compared to its Java version. Support for skipping conflicting commits during rebase has been added to the server. The ability to squash commits into the index has been added to the server. As we talked about in a previous post, during 15.0 we moved all of our source to Github. If this is the first time you are hearing about the move, then head over to the post, and give it a read for all the details about where to find our code and how to contribute. Another three months and another awesome release! Its that time again where I share all of the cool new features, enhancements and fixes with you. As usual with every release, there were lots of changes, so lets jump right in. The work that began in 13.0 to make Orion completely accessible to every developer continued at a furious pace in 14. This time around, our work was focussed on having the correct colour contrast. 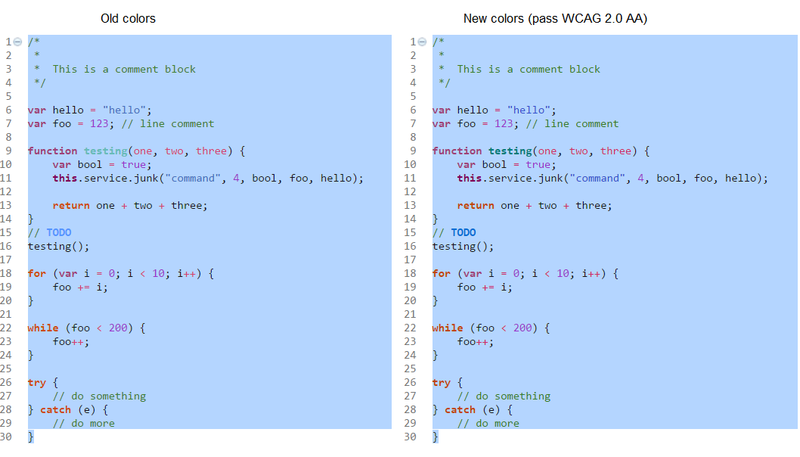 We tightened up our colours in the light theme so that all colours pass the WCAG 2.0 AA guideline for colour contrast. The changes are subtle, but they do make text easier to read, as seen in this before-and-after snapshot of selected code in the editor. Tired of being nagged about a particular code pattern used in certain places (but like to be warned elsewhere)? You can now use the new quickfix to ignore the problem in the current file. The CSS and HTML parsers have been updated to properly support SVG attributes and properties. The HTML and CSS validation has also been updated to properly process the new attributes and properties. 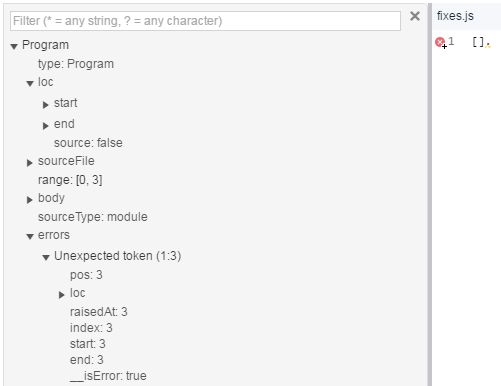 Syntax styling grammars can now define a firstLineMatch attribute. This enables multiple grammars to be defined for a content type, and the grammar that gets applied will be chosen based on the first line of content. The node server now stores its tasks metadata in a Mongo DB when running as multi-tenant. As a result, requests querying long-running tasks can now be handled by different server instances that have access to the shared Mongo DB. Previously, syntax checking took place when a file is saved – if you have autosave turned on in Orion, this is not a problem, as problem markers would be updated as you made changes. If however, you had autosave turned off, any problem markers would quickly become stale causing confusion. Now, in Orion 14, syntax checking will take place on a regular interval even if autosave is turned off, to try and avoid stale problem markers piling up. A new type of annotation has been added to Orion – the info annotation. Always wanted to only show annotations in certain parts of the IDE? Well, now you can. Simply navigate to the editor settings preference page, and look for the Annotations, Overview Annotations and Text Annotations sections to configure annotation visibility as you’d like. Don’t forget, you can also use the handy star buttons to have the preference(s) show up in the quick preference menu. Finally, after all this time, we have the ability to change the theme of not just the editor, but the entire IDE from the preferences! Not happy with the default theme in Orion? Head over to the IDE Theme preferences page to change to another theme (currently there are only two of them) or create your own (by modifying an existing theme and saving it as your own). With Orion 13.0 released (just in time for the holidays), it is time again to share with you the new & noteworthy items developed during this release. There are lots of changes across all of Orion, so lets dive in to each area and see whats new. We have been striving to make Orion as accessible as possible to all developers. In Orion 13.0 we have improved accessibility across the board – from standard labels to the code edit widget and everything in-between. We still have a ways to go, but plan to be fully accessible in Orion 14.0. The code edit widget just keeps getting better and better. In Orion 13.0 two great things happened: (1) You can finally see the keybinding dialog, and, (2) you can now add your own custom code folding! To jump right in and start enhancing your use of the widget with some cool folding, check out the docs. We have created an experimental version of Orion that runs as an Electron app! Currently, to use the app, you have to build and run it locally (we are working on providing regular builds of the app). A lot of work has gone into investigating and supporting the language server protocol since its announcement last summer. In Orion 13.0 we have experimental support for the LSP and for Java that can be used on your local machine. For full details on how to get up and running, see this great readme. 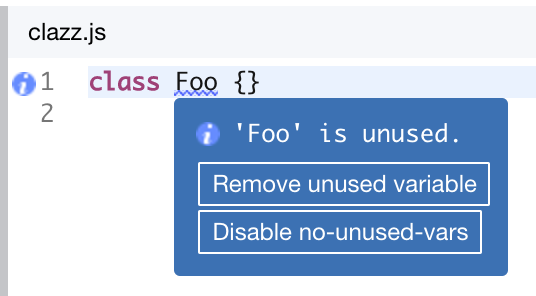 Lots of cool new stuff is available in the language tools in 13.0. We have provided 13 new linting rules (a coincidence, I promise), such as, no-extra-bind and no-implicit-coercion. The complete list of rules added in 13.0 can be found on our rules wiki. To accompany the new linting rules, many new quickfixes have been added as well, allowing problems to be quickly and easily resolved. Orion 13.0 ships with complete support for ECMA 2016. To start developing using the new language features, you have to make sure to set the ecmaVersion entry in your .tern-project file to 7. 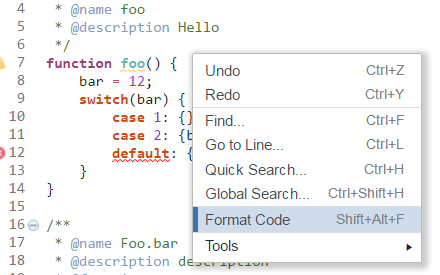 One of the most sought-after features of an IDE is the ability to quickly fix the shape of code. One of the easiest ways to do that is code formatting. In Orion 13.0 we provided a platform API (orion.edit.format) to add formatting to any language, editor hooks to format-on-save, support to format selections of code and support for .jsbeautifyrc files (for project-level formatting options). Not happy with the way the formatted code looks for JS/HTML/CSS/JSON? Simply head over to the formatting preference pages for each language and change the settings as desired. In addition to updating our HTML parser in Orion 13.0, we also provided a pluggable HTML validator to help you keep your page source in tip top shape. Like all our other validation, you can configure the HTML rules severities. The settings are found on the HTML Validation settings page. All of the linting messages coming from the CSS tooling can now appear in other languages than English. Any callers of the search API (via the file client) can now specify an array of names to be ignored by the search engine. This allows callers to ignore all kinds of things they don’t care about while speeding up the search for things they do. The new property is named ‘exclude’ and is an array of strings. See the API doc for more information. Sometimes there are things you just don’t want to see in your workspace (or that you shouldn’t see). 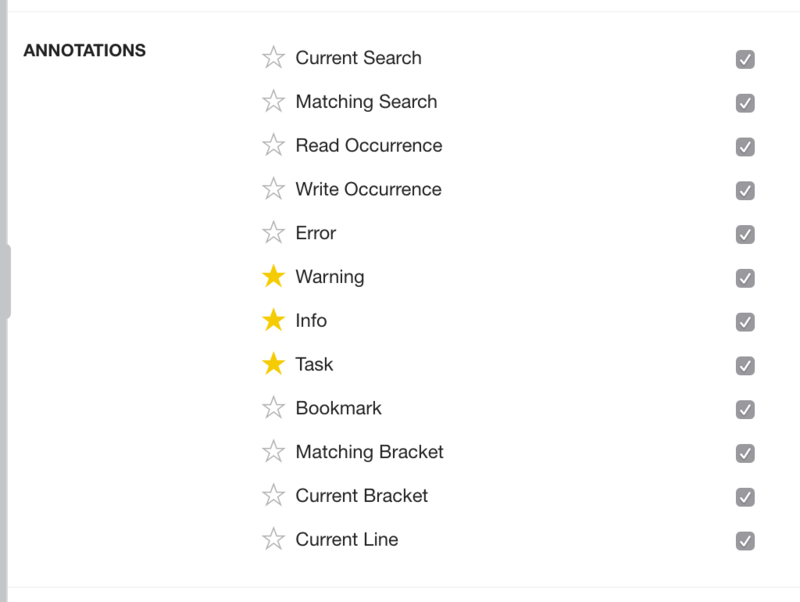 In Orion 13.0 we provided the ability to filter / hide resources from appearing in the UI. The preference for this is on the General settings preference page and is a simple comma-separated list of names of things to not show. Orion now sports a shiny new light theme! But don’t worry if you really really liked the old theme, in Orion 14 we are bringing back the theme preferences to allow this to be customized.